It was dark. It was dangerous. Lust, greed, and fear hung heavily in the air. It was enough to drive you crazy. That’s right. 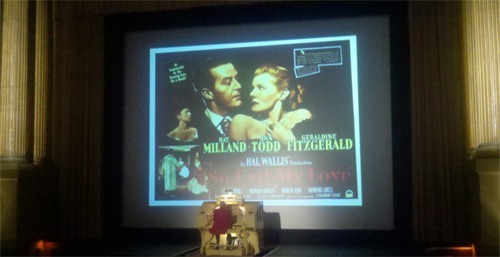 I spent Saturday at the Castro with two Noir City double bills. That’s four pictures from the 40s and early 50s I’d never seen before. While the movies where dark and painted a picture of a cruel and hostile world, they were considerably more entertaining than my Friday night venture. Crazy is the operative word, here. The theme of this year’s festival is noir victims and villains who are "all kinds of crazy––born crazy, driven crazy, and not as crazy as they seem," according the the festival’s web site. The first movie I saw was the widely respected Gaslight. With it’s MGM production values, Victorian England settings, big star (Ingrid Bergman), and major director (George Cukor), this arguably doesn’t qualify as noir. But the dark atmosphere and crime-and-insanity-driven plot make a good counter-argument. Whether it’s noir or not, it’s an exceptional psychological thriller. No other actress could look at a man with love and passion like Ingrid Bergman. Here she looks at Charles Boyer with her patented intensity. Her new marriage makes her so happy, it might even help her overcome the decade-old grief that has overwhelmed her since the unsolved murder of her aunt. But her husband is clearly hiding something, and appears to be intentionally driving her insane. Why are old, B westerns almost always laughably bad, while so many old B noirs can turn your blood to ice water? Consider Strangers In the Night (no relationship to the song), the recently-restored, 56-minute cheapie that the festival double-billed with Gaslight. A marine sergeant on leave (William Terry) visits the female pen pal he fell in love with but has never met. Turns out he has an extremely disturbed prospective mother-in-law on his hands. The second double bill of the day started with They Won’t Believe Me, a relatively big-budget noir that was, for me, the weakest of the four (those sitting near me didn’t agree). There’s no real insanity here–just a weak man (Robert Young) who can’t help cheating on his rich wife–with potentially fatal consequences. His character wasn’t very bright, but the plot required him to do one thing so stupid that I couldn’t believe it even from him. But the festival billed that movie with Don’t Bother To Knock, so all is forgiven. Marilyn Monroe, in one of her first starring roles, plays a babysitter who really should not be trusted with a child. She shouldn’t be trusted with a grown man like Richard Widmark, either. Monroe gives one of her best performances, even if it’s a little over the top, as a troubled young woman trying to hold onto the last shreds of her sanity…but not trying too hard. Anne Bancroft appears in her first movie role.